5 1/2" by 3 1/2"
A QUICK AND EASY SOLUTION FOR AN OVER-STUFFED WALLET! What to do with all those loyalty, rewards, business, and gift cards? My wallet was bursting at the seams and I could never find the one I needed when I needed it. 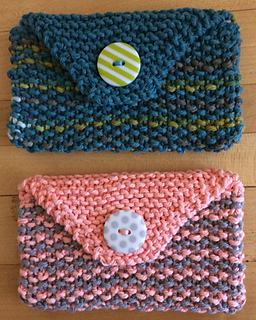 The Easy Two-Color Purse Pouch was my solution. Great for lipstick and other small items as well! All it takes are small amounts of two colors of Lily’s Sugar ’n Cream (solids or ombres -- mix and match! ), a fun button, and an hour or two of time. Two balls of yarn will make at least three pouches. Make one for each type of card. A really economical gift, with or without something inside. 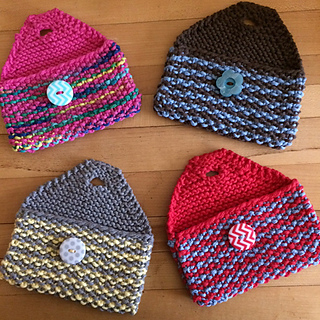 Each finished pouch measures approximately 5 1/2” wide by 3 1/2” high when closed. 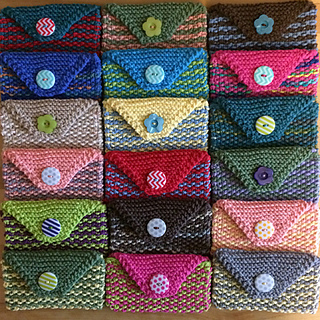 The body of the pouch is worked flat in Seed Stitch with the color not in use carried up the side. The pattern stitch changes to Garter Stitch for the flap. Work some simple decreases and one buttonhole in the flap, then sew the side edges together, add a button, and you’re done!